Surya Namaskar or Sun Salutation is an ancient way of showing gratitude towards the sun. It is a cyclical sequence of 12 postures involving specific breathing patterns that refresh your mind and revitalize your body. When performed correctly and at a faster pace, these 12 postures yield extraordinary benefits for the mind, body and soul. 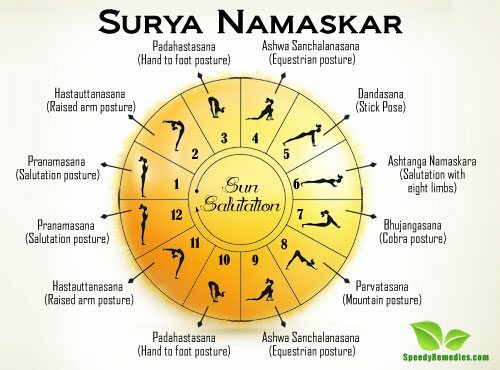 Surya namaskar is one way that leads you to deep meditation providing you peace of mind and soul. The yoga postures are relaxing as well as energizing and make the body flexible. The regular practice of Surya Namaskar improves blood circulation, maintains health and prevents you from diseases. Right from the head to toe, it offers numerous benefits for the liver, heart, stomach, intestine, chest, throat, legs and almost every other part of the body. Although there is no time boundation, it is highly recommended to perform the activity in the morning, facing the sun. Shedding those extra pounds is no more a worry. Just 4-5 rounds of surya namaskar everyday and you can go about flaunting your curves! One of the most visible benefits of surya namaskar is weight loss. The 12 postures of surya namaskar require stretching, twisting and compressing of abdominal as well as all the other muscles in the body thus helping in easy weight loss. A 2011 study published in the Journal of Bodywork and Movement Therapies concluded that regular practice of Surya Namaskar helps in maintaining and improving cardiorespiratory fitness, as well as promoting weight management. Surya namaskar is an excellent cardiovascular workout that helps in reducing flabbiness and also in toning your muscles. Surya namaskar requires intense stretching of joints and muscles in the body. This expansion and contraction ensures loosening of muscles and proper blood circulation in the body redirecting impure blood to lungs and kidneys. Additionally, frequent stretching and movement of muscles helps in improving the flexibility of the body. The formation of different postures in surya namaskar ensures symmetry of the limbs, thereby encouraging proper functioning of the internal organs. Ideal for neck, shoulder and leg muscles, surya namaskar helps in maintaining proper posture and balance in body. It also improves flexibility of limbs and spine thereby boosting height. A 2010 study published in the Journal of Physical Education & Sport concluded that sun salutation or surya namaskar is an excellent way to improve muscular endurance and flexibility of the body. Longing for a glowing and flawless skin? Resort to Surya namaskar now! Surya namaskar or sun salutation ensures stretching of almost all the joints and muscles in the body. This leads to optimum circulation of blood in the body providing you a flawless, radiant and glowing skin. All the toxins and wastes from the body is eliminated in the form of sweat, thus preventing spots, fine lines and wrinkles providing you a younger-looking, vibrant skin. Sun salutation or surya namaskar works wonders for all your digestive troubles! Surya namaskar ensures proper and smooth functioning of the intestines by increasing the flow of blood to the digestive tracts. The sequence of postures stimulates smooth intestinal actions for digestion and elimination. The forward bend posture helps in increasing the abdominal space thereby releasing the gases trapped in the system. Regular stretching and compressing of stomach tones up the digestive tract getting you rid of disorders like constipation and dyspepsia. Also, regular practice of surya namaskar prevents several disorders of the alimentary canal by stimulating peristalsis of intestines and removing waste from the body. Battling sleep disorders? Switch to sun salutation and enjoy the slumber! The unique blend of physical exercises along with breathing techniques not only relaxes your mind but also keeps your mind at peace. This in turns proves beneficial in promoting a sound sleep along with reducing anxiety. Pranayama (first module of the surya namaskar practice) involves deep breathing to influence the flow of prana (life force) in the body. The process of deep breathing ensures peace and calmness of the mind along with feeding in more oxygen into the lungs and other organs. Peace of mind is ultimately the key factor leading to a better and sound sleep. Surya namaskar is especially beneficial for women suffering from menstrual disorders like severe pain, cramping, irregularity and excessive flow. However, women are advised to discontinue the practice during the period of menstruation. It should be practiced before or after the menstruation period. The cobra pose specifically stretches and tones the abdomen, relieving the body of menstrual pain, fatigue and stress. Additionally, surya namaskar helps in the involution of uterus in women. Surya namaskar also stimulates glands and strengthens pectoral muscles which further helps in restoring any lost elasticity and firming of breasts. For people suffering from diabetes, surya namaskar module is a boon! The sun salutation module increases supply of blood in the body, thus bringing down blood sugar levels in the body. The yoga postures exert pressure on the pancreatic walls thereby helping stimulation and improvement in production & administration of insulin. A 2005 study published in the Nepal Medical College Journal observed positive effects of surya namaskar on decreasing waist-hip ratio and changing insulin levels in the body. The study concluded that these were helpful in the management of Type 2 diabetes. Regular practice of sun salutation gets you rid of stress & anxiety. Surya namaskar controls cortisol (stress hormone) and increases the production of serotonin (mood-stabilizer hormone), thus keeping you livelier and stress free. The module reduces building up of tension in body and promotes relaxation thereby reducing anxiety and restlessness. Also, the postures of surya namaskar harmonize the activities of endocrine glands thus ensuring proper functioning of the entire body. Surya Namaskar is one of the best ways to detoxify your body. The inhalation and exhalation technique ensures thoroughly ventilated lungs and oxygenated blood, which further helps in removing carbon dioxide, lymphatic fluids and toxic gases from the body. Not just the breathing technique, but deep stretches of the module also help in detoxification process. The forward and backward bends relieve the body off digestive problems. Also, toxins are eliminated from the body in the form of sweat which is produced during the performing of surya namaskar. The practice of this module invigorates the organs like lung and heart and increases their functional ability. The active expansion and contraction of the air sacs during breathing process prevents the build-up of germs and other diseases. Further, proper ventilation of lungs and oxygenation of blood increases the functional capacity of the system that prevents rise in blood pressure and reduces palpitations. A 2011 study published in the Recent Research in Science and Technology revealed that surya namaskar had a significant impact on increasing systolic blood pressure, peak expiratory flow rate, forced vital capacity and decreasing respiratory rate, heart rate and diastolic blood pressure. A 2014 study published in the Journal of Clinical & Diagnostic Research advocated that surya namaskar is greatly helpful in preventing respiratory disorders among individuals. Proper detoxification and oxygenation of blood further ensures effective functioning of the circulatory system, thereby increasing the heartbeats. Also, this ensures proper working of the lymphatic system which helps in killing of germs, bacteria and illness. 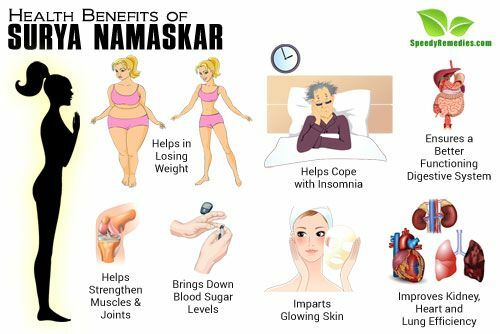 Surya namaskar also ensures proper functioning of the kidneys by gently massaging their blood supply and speeding up blood circulation in the body. This ensures efficient blood filtration by the organs throughout the body. Journal of Physical Education & Sport: THE EFFECT OF SURYANAMASKAR YOGASANA ON MUSCULAR ENDURANCE AND FLEXIBILITY AMONG INTERCOLLEGE YOGINIS.